Grabba Fingerprint readers have wide application where mobile ID checking and verification is required. 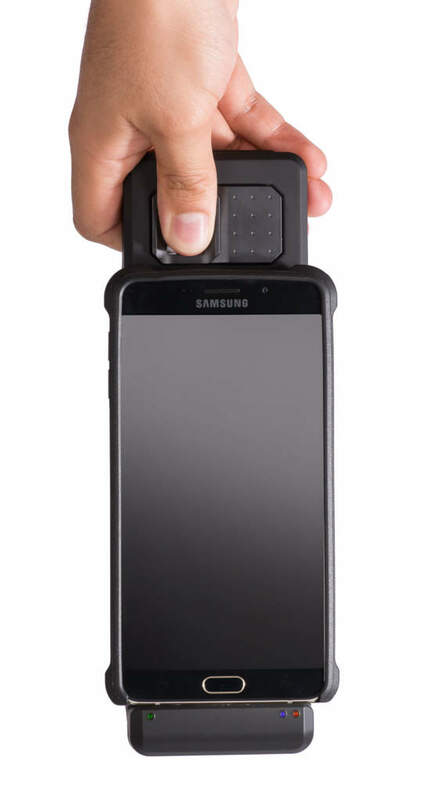 Grabba’s Integrated Biometrics Sherlock Fingerprint Module completed a review conducted by representatives of the FBI and the MITRE laboratory located in Bedford, Massachusetts, resulting in a statement of full compliance with the “EBTS Appendix F Mobile ID FAP45 using Appendix F Specifications”. On June 1st, 2016, the Federal Bureau of Investigation (FBI) certified a Grabba device integrated with the Sherlock FAP45 module for fingerprint capture is in compliance with the FBI CJIS division’s Next Generation Identification System Image Quality Specification (IQS). The WSQ version provides high quality fingerprint images and an industry standard method of compression to make remote verification faster, cost-effective and more reliable. This version is best suited for remote verification tasks. This reader provides high quality fingerprint images and includes storage for up to 1000 template in the Local Data Base (LDB). This makes it ideal for enroll and verify applications. This reader adds Fake Fingerprint Detection (FFD) to the SFP module capabilities so as to mitigate attempts at fingerprint falsification. This model allows both local and remote verification. This module is PIV Certified. This fingerprint module is the most complete and flexible solution offering not only WSQ compression, but also Fake Fingerprint Detection (FFD) and both local and remote matching and enrolment as templates can be stored in the module, device or in the cloud. This module is PIV Certified. This fingerprint module enables fingeprint capture in standalone applications, smartphones and tablets. It also includes dual at print and single-finger roll scan. Ideal for use with mobile computers, hand-held devices, smartphones and tablets.